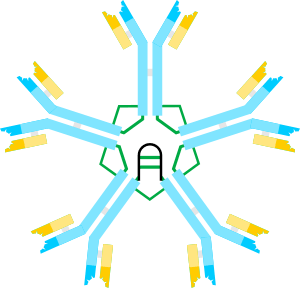 IgM (Immunoglobulin M) antibody molecule consisting of 5 base units. IgM scheme. Heavy chains are blue; light chains are yellow. Immunoglobulin M, or IgM for short, is a basic antibody that is produced by B cells. IgM is by far the physically largest antibody in the human circulatory system. It is the first antibody to appear in response to initial exposure to an antigen. The spleen, where plasmablasts responsible for antibody production reside, is the major site of specific IgM production. IgM is a polymer, where multiple immunoglobulins are linked together by strong covalent bonds known as disulfide bonds. 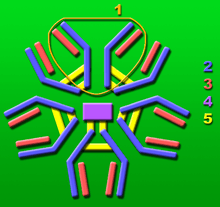 This occurs mostly to produce pentamers (5 linked immunoglobulins) but also as a hexamer (six linked immunoglobulins). IgM has a molecular mass of approximately 970 kDa (in its pentamer form). Because each immunoglobulin monomer has two antigen binding sites, a pentameric IgM has 10 binding sites. Typically, however, IgM cannot bind 10 antigens at the same time because the large size of most antigens hinders binding to nearby sites. The J chain is found in pentameric IgM but not in the hexameric form, perhaps due to space constraints in the hexameric complex. Pentameric IgM can also be made in the absence of J chain. At present, it is still uncertain what fraction of normal pentamer contains J chain, and to this extent it is also uncertain whether a J chain-containing pentamer contains one or more than one J chain. Although hexameric IgM without J chain has higher efficiency of complement fixation than pentameric IgM with J chain. Because IgM is a large molecule, it cannot diffuse well, and is found in the interstitium only in very low quantities. IgM is primarily found in serum; however, because of the J chain, it is also important as a secretory immunoglobulin. Due to its polymeric nature, IgM possesses high avidity, and is particularly effective at complement activation. By itself, IgM is an ineffective opsonin; however it contributes greatly to opsonization by activating complement and causing C3b to bind to the antigen. In germline cells, the gene segment encoding the μ constant region of the heavy chain is positioned first among other constant region gene segments. For this reason, IgM is the first immunoglobulin expressed by mature B cells. On mature B cells, both IgM and IgD are co-expressed through long mRNA transcripts which undergo differential splicing; the transcript for IgM is produced when the VDJ exon is spliced to the Cμ exon, with polyadenylation at p(A1). In contrast the IgD transcript is produced when the VDJ exon is spliced to Cδ exons, with polyadenylation further downstream at p(A2). It is also the first immunoglobulin expressed in the fetus (around 20 weeks) and phylogenetically the earliest antibody to develop. IgM antibodies appear early in the course of an infection and usually reappear, to a lesser extent, after further exposure. IgM antibodies do not pass across the human placenta (only isotype IgG). These two biological properties of IgM make it useful in the diagnosis of infectious diseases. Demonstrating IgM antibodies in a patient's serum indicates recent infection, or in a neonate's serum indicates intrauterine infection (e.g. congenital rubella syndrome). The development of anti-donor IgM after organ transplantation is not associated with graft rejection but it may have a protective effect. In research, purified antibodies are used in many applications. IgM antibodies for research applications can be found directly from antibody suppliers, or through use of specialist search engines like CiteAb, Antibodypedia, and SeekProducts. Research antibodies are most commonly used to identify and locate intracellular and extracellular proteins. Researchers using antibodies in their work need to record them correctly in order to allow their research to be reproducible (and therefore tested, and qualified by other researchers). Less than half of research antibodies referenced in academic papers can be easily identified. A paper published in F1000 in 2014 provided researchers with a guide for reporting research antibody use. IgM in normal serum is often found to bind to specific antigens, even in the absence of prior immunization. For this reason IgM has sometimes been called a "natural antibody". This phenomenon is probably due to the high avidity of IgM that allow it to bind detectably even to weakly cross-reacting antigens that are naturally occurring. For example, the IgM antibodies that bind to the red blood cell A and B antigens might be formed in early life as a result of exposure to A- and B-like substances that are present on bacteria or perhaps also on plant materials. IgM antibodies are mainly responsible for the clumping (agglutination) of red blood cells if the recipient of a blood transfusion receives blood that is not compatible with their blood type. IgM is more sensitive to denaturation by 2-mercaptoethanol than IgG. This technique was historically used to distinguish between these isotypes before specific anti-IgG and anti-IgM secondary antibodies for immunoassays became commercially available. Serum samples would be tested for reactivity with an antigen before or after 2-mercaptoethanol treatment to determine whether the activity was due to IgM or IgG. ↑ Bruce Alberts; Alexander Johnson; Julian Lewis; Peter Walter; Martin Raff; Keith Roberts (2002). "Chapter 24". Molecular Biology of the Cell (4th ed.). Routledge. ISBN 978-0-8153-3288-6. ↑ Racine R, McLaughlin M, Jones DD, et al. (2011). "IgM production by bone marrow plasmablasts contributes to long-term protection against intracellular bacterial infection". J. Immunol. 186 (2): 1011–21. doi:10.4049/jimmunol.1002836. PMC 3208352 . PMID 21148037. ↑ "Chapter 62". Bailey & Love's Short Practice of Surgery (25th ed.). p. 1102. ↑ Bours J, Reitz C, Strobel J, Breipohl W (May 2005). "Detection of secretory IgM in tears during rhino-conjunctivitis". Graefes Arch. Clin. Exp. Ophthalmol. 243 (5): 456–63. doi:10.1007/s00417-004-1048-y. PMID 15931543. 1 2 Wiersma EJ, Collins C, Fazel S, Shulman MJ (1998). "Structural and functional analysis of J chain-deficient IgM". J. Immunol. 160 (12): 5979–89. PMID 9637512. ↑ Randall TD, King LB, Corley RB (1990). "The biological effects of IgM hexamer formation". Eur. J. Immunol. 20 (9): 1971–9. doi:10.1002/eji.1830200915. PMID 2120070. ↑ Johansen FE, Braathen R, Brandtzaeg P (2000). "Role of J chain in secretory immunoglobulin formation". Scand. J. Immunol. 52 (3): 240–8. doi:10.1046/j.1365-3083.2000.00790.x. PMID 10972899. ↑ Wellek, B.; Hahn, H.; Opferkuch, W. (1 February 1976). "Opsonizing activities of IgG, IgM antibodies and the C3b inactivator-cleaved third component of complement in macrophage phagocytosis". Agents and Actions. 6 (1–3): 260–262. doi:10.1007/BF01972219. PMID 941799. Retrieved 24 March 2011. 1 2 Murphy, K; Weaver, C (2016). Janeway's Immunobiology. New York, NY: Garland Science/Taylor and Francis. p. 195. ISBN 9780815345053. ↑ McAlister CC, Gao ZH, McAlister VC, et al. (February 2004). "Protective anti-donor IgM production after crossmatch positive liver-kidney transplantation". Liver Transpl. 10 (2): 315–9. doi:10.1002/lt.20062. PMID 14762873. ↑ "On the reproducibility of science: unique identification of research resources in the biomedical literature". PeerJ. 2 September 2013. Retrieved 1 September 2014. ↑ "Reporting research antibody use: how to increase experimental reproducibility". F1000research. 23 August 2013. Retrieved 1 September 2014. ↑ Jayasekera JP, Moseman EA, Carroll MC (2007). "Natural antibody and complement mediate neutralization of influenza virus in the absence of prior immunity". J. Virol. 81 (7): 3487–94. doi:10.1128/JVI.02128-06. PMC 1866020 . PMID 17202212. 1 2 Cohen IR (1967). "Natural and immune human antibodies reactive with antigens of virulent Neisseria gonorrhoeae: immunoglobulins G, M, And A" (PDF). J. Bacteriol. 94 (1): 141–8. PMC 251882 . PMID 4961630. ↑ Capel PJ, Gerlag PG, Hagemann JF, Koene RA (1980). "The effect of 2-mercaptoethanol on IgM and IgG antibody activity". J. Immunol. Methods. 36 (1): 77–80. doi:10.1016/0022-1759(80)90096-4. PMID 7204997.